Chelsea's under-21 side will host League One club Portsmouth in the EFL Trophy third round, while Leicester's academy team will travel to Oldham. Leicester and Chelsea are the last of the 16 Premier League and Championship academy sides that entered the competition to remain. Elsewhere, Yeovil host their League Two and west country rivals Forest Green. League Two leaders Luton, the most prolific team in England's professional divisions, host Peterborough. The Hatters beat West Ham's under-21 side 4-0 to set up the third-round tie. Charlton, who got past Swansea's academy team, face Oxford in one of three all-League One fixtures, with Blackpool travelling to Shrewsbury and Fleetwood going to Bury. Meanwhile, Rochdale face League Two club Lincoln City. The third-round ties, split into northern and southern sections, are to be played during the week beginning 8 January 2018. To reach the last 16 of the competition, both Premier League academy sides from Chelsea and Leicester called on high-priced players. 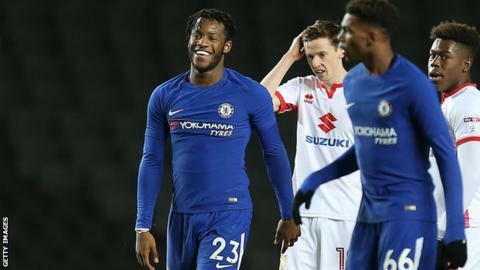 Michy Batshuayi, who cost Chelsea £33m when they signed him from Marseille in July 2016, scored twice in Wednesday's win over MK Dons, having faced Atletico Madrid in the Champions League the previous day. Nigeria striker Kelechi Iheanacho was one of a host of Premier League regulars in a Leicester line-up worth about £45m in transfer fees that beat Scunthorpe on Tuesday.